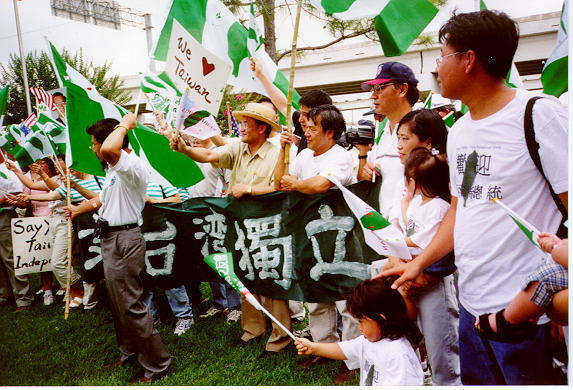 About 3,000 supporters gathered outside a hotel in Houston, Texas, yesterday to greet President Chen Shui-bian as he arrived for a meeting with US representatives. 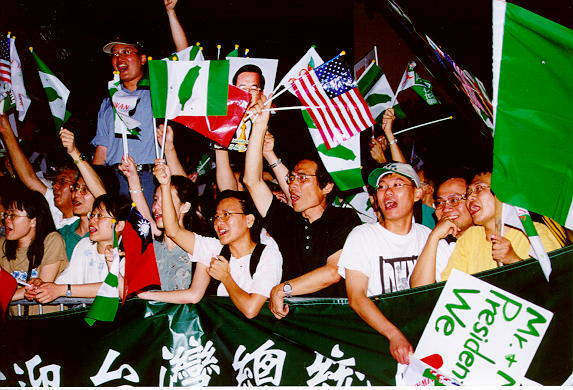 As Chen and his wife arrived at the Post Oak Doubletree Hotel in Houston about 8pm Saturday night, the supporters gave him a raucous welcome. Chen blew kisses and bowed, pumping his fist to the rhythm of their chants. 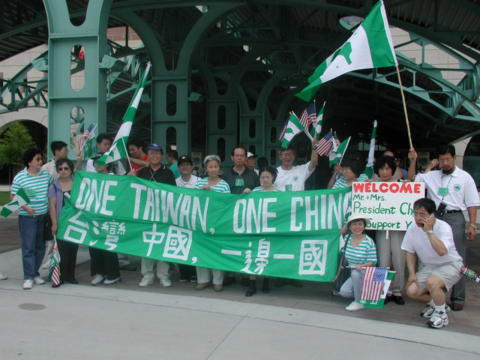 Shirley Yen, an accountant who has lived in Houston for 20 years, wore a sandwich-board-style poster on which was a map of Taiwan. 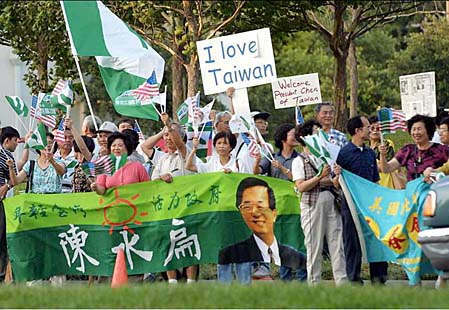 "Taiwan is already independent. 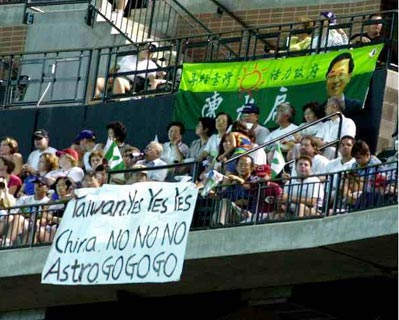 Communist China has never had any relationship with Taiwan," read the sign. President Chen was greeted at the hotel by Texas Assistant Secretary of State Geoffrey S. Connor, who presented him with a state flag and a certificate making Chen an honorary resident of Texas. 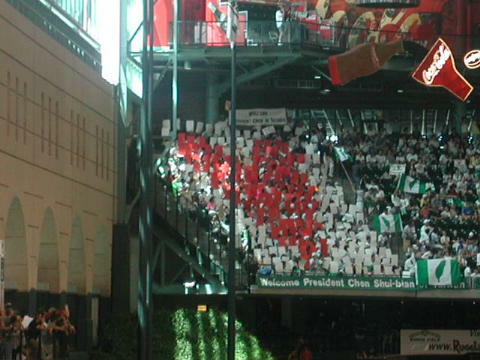 Connor said Houston and Taipei have close sister-city relations and share warm feelings for one another. 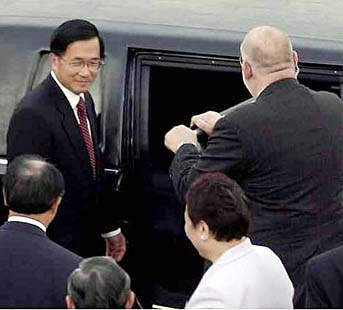 Solomon P. Ortiz, a Democratic congressman from Texas, also paid his respects to Chen at the hotel on Saturday evening. Ortiz said that Chen was a leader who inspired respect, and both Democrats and Republicans should welcome him. His discussion with Chen centered on Chen's trip to Latin America. 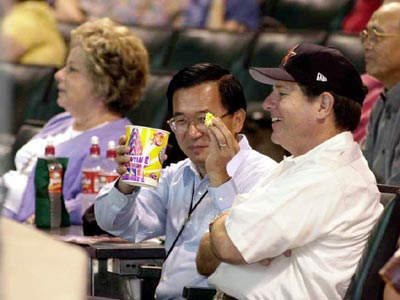 President Chen and US House Majority Whip Tom DeLay are scheduled to dine at the "Taste of Texas" steakhouse on Sunday afternoon, then attend a Houston Astros-Los Angeles Dodgers game at Enron Field. 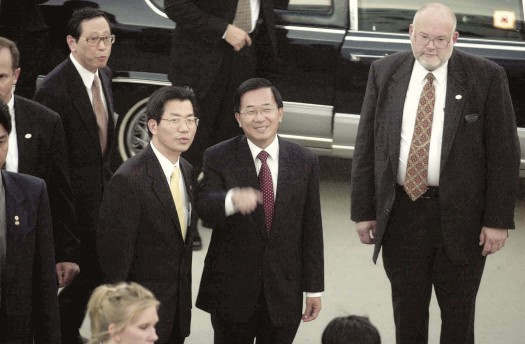 While Chen was at the ball game, first lady Wu Shu-chen, was to go shopping at the Saks Fifth Avenue department store accompanied by the wives of the secretary-general of the National Security Council, Chuang Ming-yao, and Taiwan's chief representative in the US, Chen Chien-jen . 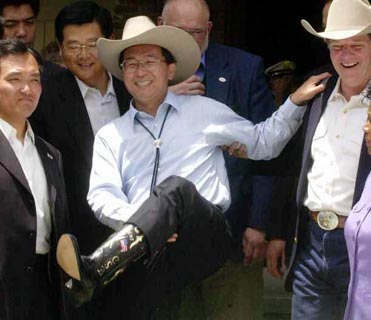 President Chen would become the second foreign head of state to visit the Taste of Texas, a Houston landmark where the current holder of the world record for steak-eating won his title by eating 132 ounces (3.6kg) of steak in a single sitting. The special meal served to Chen's 260-strong party was to have more modest 10 ounce (280g) steaks only. To receive Chen the usually packed steakhouse was to be completely sealed off at noon, Sunday, to concentrate on serving the VIPs. To greet Chen, the steakhouse's manager learned two Taiwanese phrases, "welcome" and "thank you." He said that since the restaurant was established in 1977, former president George Bush has visited three times, including a banquet hosted there in 1999 for the president of Paraguay, who had come to celebrate the 50th anniversary of the UN. 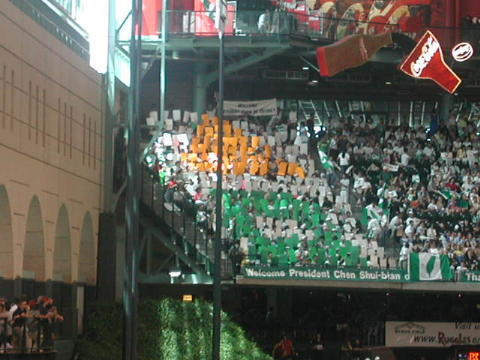 In 1998, the current president, George W. Bush announced at the steakhouse that he would run for re-election to the position of governor of Texas.